Own a Alcatel Evo7 Android tablet with Sun Broadband Sim only from Sun Cellular. Get this tablet free on Sun Gadget Plan 600 and Plan 899, Alcatel Evo 7 is bundled with 3G module that you can use to access internet without using Wi-Fi and other external wireless device. 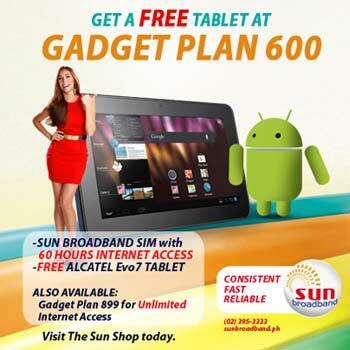 Continue reading more about Alcatel Evo7 Tablet Sun plan below.